23% of respondents said this one thing is a relationship deal-breaker New report shows how tough it is for women in tech, especially at conferences The super successful CEO of The Wing has a seemingly crazy email hack that is a major time saver These are the most common things people lie about on their resumes How to curb friends and family from asking for free professional services from you Michelle Obama is a surprise textbook example of how women thrive and grow through adulthood 5 easy ways to improve your morning commute mood What is credit invisibility? New report shows how tough it is for women in tech, especially at conferences Women, stop apologizing: Embrace an attitude of gratitude The surprising names that are most likely to get a callback from hiring managers The super successful CEO of The Wing has a seemingly crazy email hack that is a major time saver Michelle Obama is a surprise textbook example of how women thrive and grow through adulthood 5 easy ways to improve your morning commute mood 3 things it’s not too late to start that will make you happier, healthier and more successful What is credit invisibility? Your brain on skim reading Why dressing like a CEO no matter your job level will prime you for career success Working with extroverts (written by an actual extrovert) Why the next text you get may be the start of your job interview How to curb friends and family from asking for free professional services from you Michelle Obama is a surprise textbook example of how women thrive and grow through adulthood 3 things it’s not too late to start that will make you happier, healthier and more successful What is credit invisibility? I hope you will be treated unfairly My single best tip for a job interview When the kid interviewing you says you’re too old I had a bad day Michelle Obama is a surprise textbook example of how women thrive and grow through adulthood 5 easy ways to improve your morning commute mood 3 things it’s not too late to start that will make you happier, healthier and more successful What is credit invisibility? Get noticed by over 25,000+ verified recruiters searching for top talent. 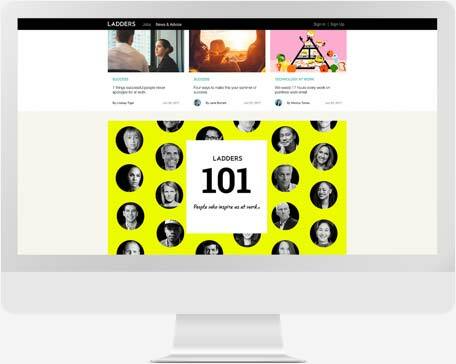 Look your best with a Ladders Resume and apply to jobs in just two clicks. Find your match from over 250,000+ screened jobs. Ladders News publishes fresh articles daily on career-related topics to keep you on the path to success.